Quick update from last week. The colored histograms are just a measure of how much light of that color there is. Being more than 3 colors in the histograms through lightroom I was a little perplexed. Now on to the rule of thirds. The rule of thirds basically states to put a subject or focus not in the center of a rectangular image. If we make a 3 by 3 grid in our image the focus should be on one of the lines to make the picture appealing to the eye, it was first written down by John Thomas Smith in 1783. One of the big places that it causes issues is horizons. If we are taking a landscape, seascape, cityscape, etc we generally don't want the horizon in the middle. We want it a third from the top or bottom. It changes the focus of the image. For example if the sky is just a blue sky with no clouds or lacks anything interesting while the city in the lower portion has action that adds to the image then leave less sky and more city and now the sky is background. If the sky has something going on such as stars, clouds, a sunset/sunrise then if we leave more sky and the lower portion becomes foreground interest. It depends on what we are trying to do with the image. Here is a picture of the pier in Oceanside, CA. 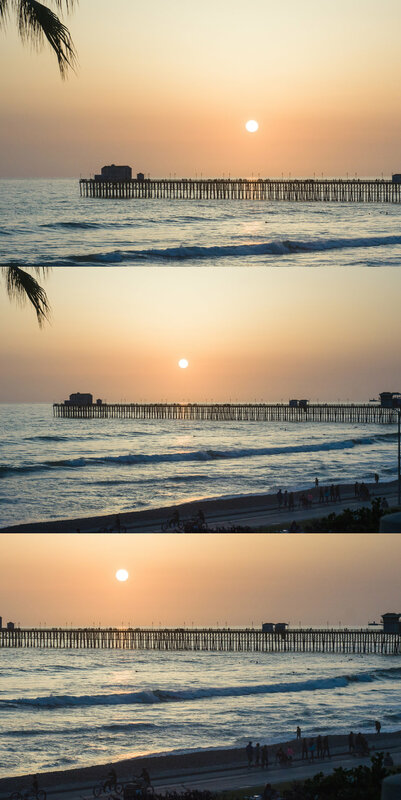 The top image has the horizon in the bottom 3rd, the bottom has it in the top 3rd, and the middle image is the original. Now look at each image and see where our eye is drawn and how that effects what the image is about. If we are taking portraits then we should focus on the eyes, sharply focused eyes draw a person in and make it look more alive. When we talk to people most people focus on the other person's eyes. So the eyes are the focal point not the subject. If we place the eyes on one of the thirds lines then it takes the person out of the center of the image. Generally placing the eyes on the top 3rd line brings the focus to the person and not the scene and placing the eyes on the bottom 3rd line shows less of the person and brings attention to where they are. This is Lumina, my youngest daughter. The image on the left has her eyes at the top 3rd, the image on the right her eyes are on the bottom 3rd, and the image in the middle is the original. Again notice where our eyes wander in each image. Are they more on her or more on her surroundings? Granted this is not always the case and there are times to break the rules. However if we want to break the rules we have to know the rules first. I will go more into rule breaking some other week. Most digital cameras have a rule of thirds setting on them where a grid will be places on the screen and it can help with subject placement. Owners manuals are helpful for finding it. Sometimes though it is easier to put things you want in focus right in the middle and crop them later. These images are an example of that too. Try it both ways and see what works for you. Now go out and shoot.